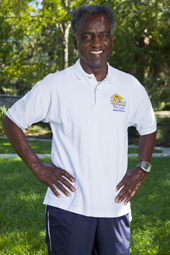 On November 30, 2013, at age 72, Rudy Smith shattered his completed race, Rudy broke his own record – for the fourth consecutive year. And he didn’t just complete the races…he nailed them: 16 first-place finishes in races that included three triathlons, six duathlons, one Ironman and two marathons. You think people slow down after turning 65? Try telling that to Rudy – a man who’s run a marathon on all seven continents and whose performance only improves each successive year. If you’d like to know what special elixir or performance enhancing substance Rudy uses to win all these races, you’re in for a big disappointment. He doesn’t even take vitamins, let alone medications or energy supplements. Instead, the key to Rudy’s success is his singular focus on personal accountability – the conviction that he alone is responsible for the outcome of his actions. When he fails to achieve a goal, Rudy makes no excuses. It’s not the weather…or the shoes…or the competition… or the venue…certainly not the whims of luck; it’s Rudy. He treats any mishap or disappointment as a learning experience. What could he have done differently? How could he have planned better? Personal accountability at this level is difficult to say the least, but for folks like Rudy, with the maturity and inner strength developed over a lifetime of experience, it’s a roadmap for success. As children, we’re dependent on the help and guidance of adults, and it’s easy to blame others when things don’t go our way. As we grow up, we become independent and build our own lives. As we grow older, the degree to which we accept personal responsibility can determine the extent to which we fulfill our ambitions and realize our goals. Just ask Rudy Smith. Rudy Smith … Peoples Health Champion.